I've seen the mind do some amazing things. I once attended to a 75 year old woman whose husband thought she was possessed by the Devil. She was speaking in a deep voice using a different language and needed three huge officers and my partner to hold her down as I sedated her. When she did speak to me in English she used words I was surprised an elderly lady would even know. It scared the crap out of me! Although this was an elderly lady we've all had big violent patients in the back of our ambulances that we weren't able to 'talk down'. These are the scariest calls for me, as I know if they break through their restraints they would attack us without holding back. Of course if this does happen before we can sedate them we just leave the ambulance but it seems to take a long time to draw up medication and administer it while your patient is threatening your life. I also wanted to mention that despite my artwork I still believe this is the best job in the world and I love it. 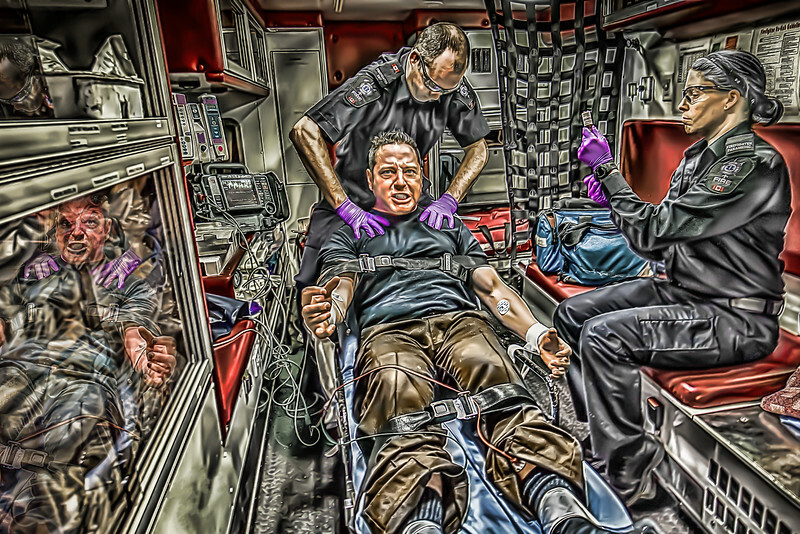 I've been asked to create some more positive images that portray our profession. My goal in creating this artwork is to raise PTSD awareness and to give the public insight into some of the stressful events in our world. If you like my artwork please like my Dansun Photos Facebook Page. In the New Year I will be giving away hand signed prints to the people on my 'Likes' list. Stay safe Brothers and Sisters and Happy Holidays.